Great web-sites don't mean they breed dogs with care. 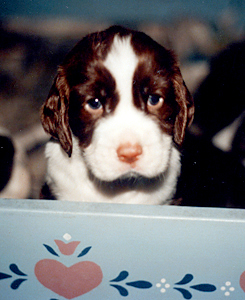 Be sure to visit our parent club web-site, English Springer Spaniel Field Trial Assn., offering a great deal of information for someone looking for a Springer Puppy. Remember, nothing is better than Puppy Breath from a new Springer baby.